Did you know that you could make oil-free microwave popcorn in a plain brown paper lunch bag? If you add your own homemade popcorn salt, you’ll have a lightly salted, fat-free, fiber rich snack that takes minutes to make, and is delicious. On top of that, it’s filling and only contains about 30 calories per cup. Popcorn salt is a finely ground salt – almost a powder. 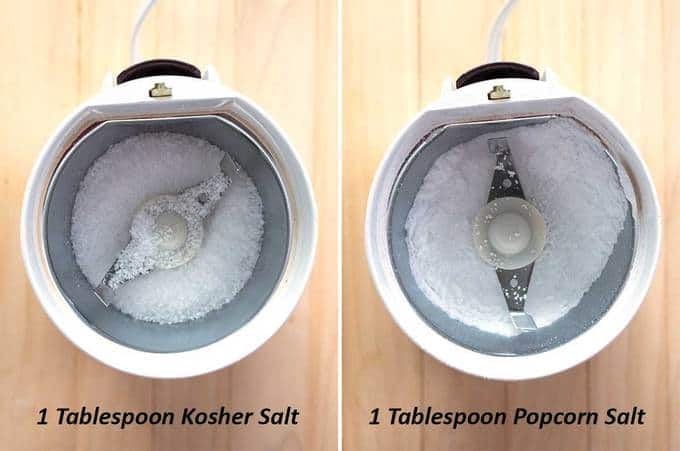 This allows it stick to the little nooks and crannies of the popcorn whereas table salt or Kosher salt tends to just fall off. You can certainly buy popcorn salt in the grocery store. However, if you have a spice grinder, you can make your own in about 10 seconds! Just add some Kosher salt to your grinder, and process it for about 10 seconds. Voila – your own popcorn salt! I use the following for my Skinny Microwave Popcorn in a Paper Bag: 1/4 cup popcorn kernels, 1/4 teaspoon popcorn salt, brown paper lunch bag, and measuring spoon. That’s it! You might be wondering about oil. If you like, you could add 1/2 teaspoon of vegetable oil, but it’s really not necessary. Because of the fineness of the popcorn salt and the steam from the popping corn, the salt really does stick! I added the popcorn kernels, and popcorn salt to the brown paper lunch bag. I folded the top of the paper bag three times to ensure that it didn’t open up while the kernels were popping. Then, I placed the bag in the microwave with the fold down. The first time I did this, I was concerned that the bag would fly open and make a mess. Every time I’ve made the popcorn this way, the bag has stayed shut! I do, however, make sure that I don’t overfill the bag. Anyway, my microwave has a popcorn setting on it, so I just selected that. Otherwise, I would have set the microwave to high power for several minutes, and watched it very closely to ensure that the popcorn didn’t burn. I ended up with delicious oil-free, low calorie, lightly salted, perfectly popped popcorn. It doesn’t get much better than that. Yum! Did you know that you could make oil-free microwave popcorn in a plain brown paper lunch bag? If you add your own homemade popcorn salt, you'll have a lightly salted, fat-free, fiber rich snack that takes minutes to make, and is delicious. On top of that, it's filling and only contains about 30 calories per cup. Add popcorn kernels and popcorn salt to paper bag. Fold the top three times. Place bag fold-side down in microwave. Microwave on popcorn setting. If your microwave does not have a popcorn setting, microwave on high or full power for 2 to 3 minutes, or until there are about 2 seconds between pops. Carefully open bag, and pour popcorn into serving bowl. To make your own popcorn salt, process Kosher salt in spice grinder for 10 seconds, or until it becomes very fine and powdery.